Back to the grazing part-- chips and dips. Seriously, one can never have too many of these in their recipe caché. They are a real love/hate for me. I love them because they are darn tasty and hate them because they sit there on the table asking you to come back for more. 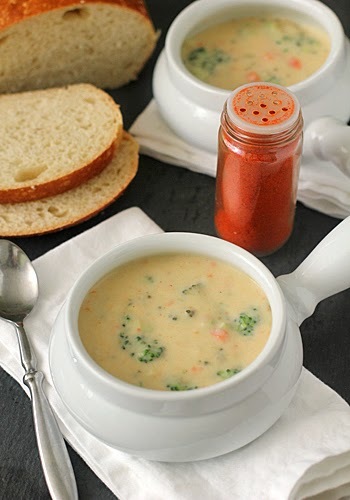 This recipe is a perfect example of such a relationship. It is an original recipe that I created after a well-liked Mexican restaurant in town closed its doors, bringing its wonderful salsa with it. Their house salsa and homemade chips were the devil on my shoulder (c'mon-- just one more). 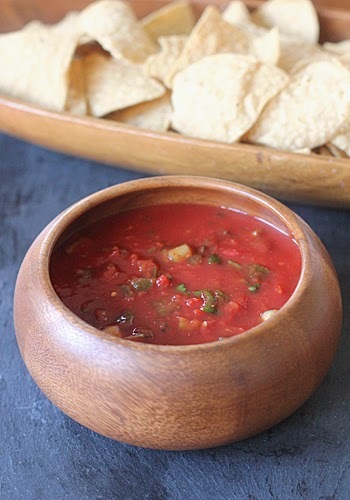 This is hands down the easiest salsa recipe to make. Most of the flavor/heat work is done for you with the use of pickled jalapeños from a jar. You can use mild, but I highly recommend the hot. Roughly chopped green onions and cilantro add to the flavor profile, then it is just salt to taste. It's quite good right off the bat, but give it some time for the ingredients to mingle... and you will have the devil whispering in your ear. Speaking of game day-- I have listed a round-up from the archives on the day's various grazing components from snacks to sweets. As much as I embrace my Southern roots, I am fortunate to have married into a family with a bi-cultural heritage, those cultures being Polish and Norwegian. It brings a little more food love into my kitchen. 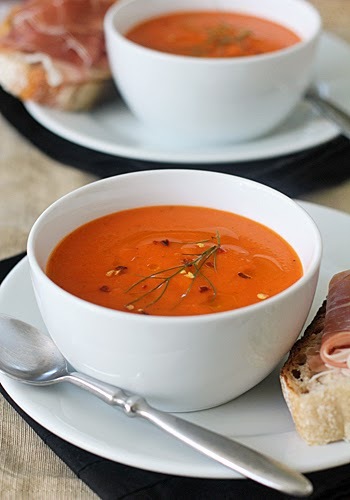 Like many of the foods that I have introduced to them, Norwegian fare was completely new to me. I mean, I grew up eating big and buttery rolls, biscuits, and cornbread at the table. 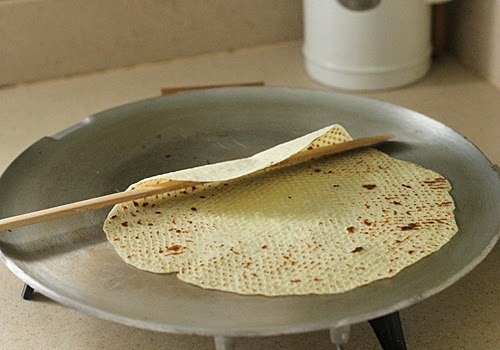 I didn't even eat flat tortillas with tacos (I know-- the horror). So this Scandinavian flat bread was a foreign concept to me. 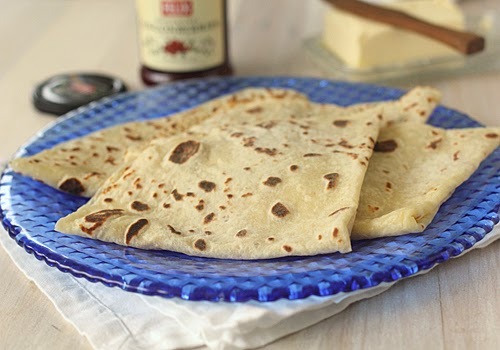 But I have to admit that lefse is delicious while also doing a fine job of sopping up any goodness on your plate, especially swedish meatball gravy. It also makes for a sweet snack when slathered with butter and sprinkled with sugar or lingonberry preserves. 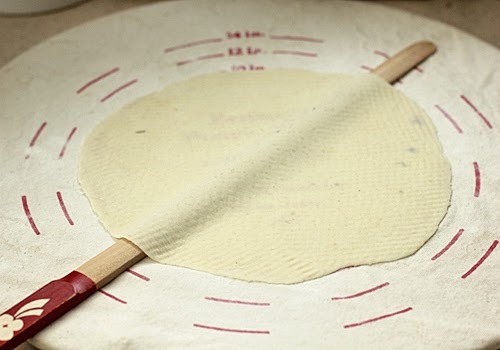 The dough itself is rather simple to make, but the base does require overnight refrigeration, so plan ahead. 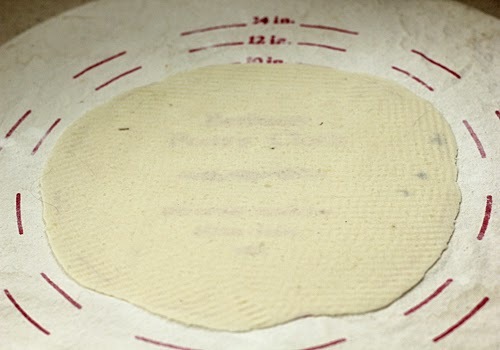 Speaking of the dough base, it consists of cooked and mashed potatoes. (I guess you could liken these to a potatoey tortilla thingy. Shhh-- don't tell my husband I said that.) The unpeeled potatoes are boiled until tender, cooled, peeled, and then forced through a ricer. 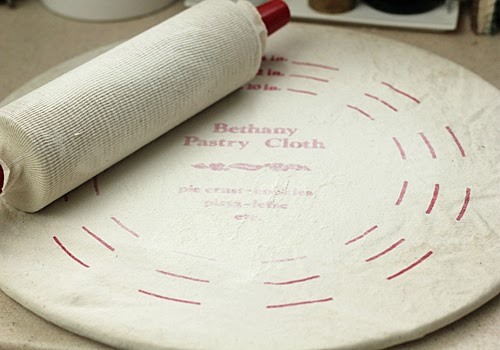 Butter, half-and-half, sugar and salt are added to enrich the dough. 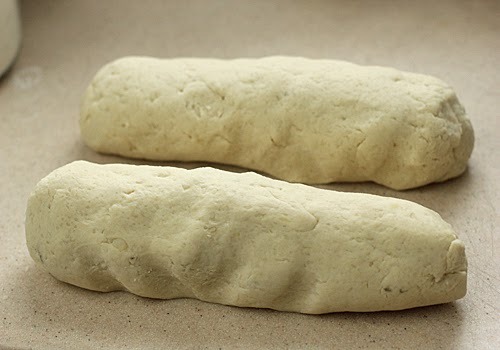 The flour is kneaded in the next day to form a smooth dough. 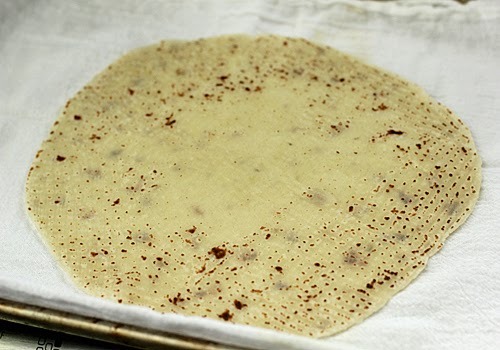 Below I have included a few step-by-steps once the dough has been made. There is just one catch... special equipment is required. 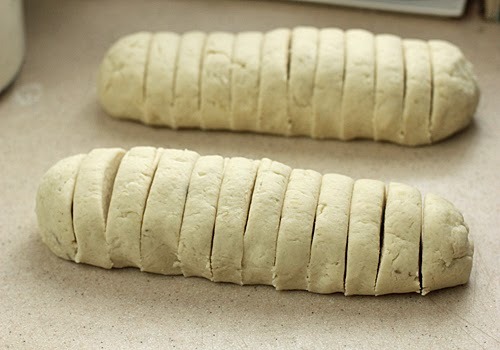 Once you have made the dough, divide it into two logs. Cut each log into 10-12 pieces. 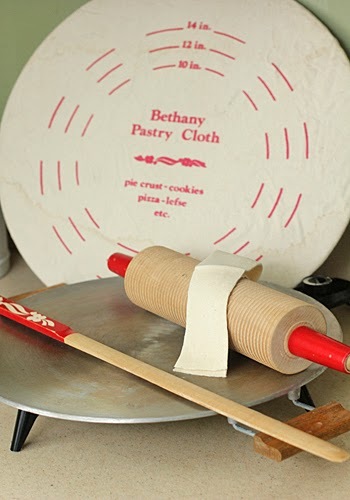 Generously massage some flour into the board and on the rolling pin "sock". 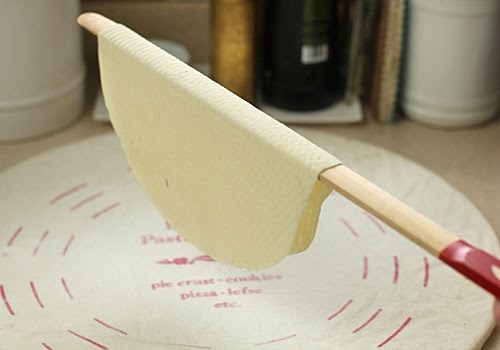 Roll a piece of dough into a ball, then flatten it onto the board with your hand. 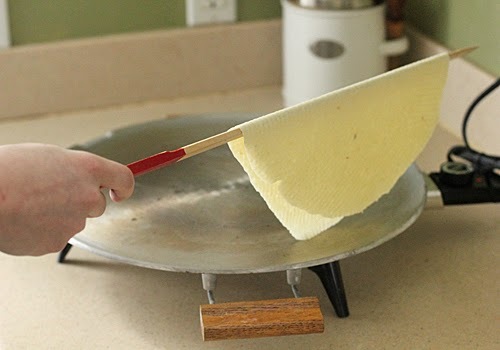 Slide the lefse stick under the dough and, using a back and forth motion, release it from the board and turn it over to continue rolling it out. 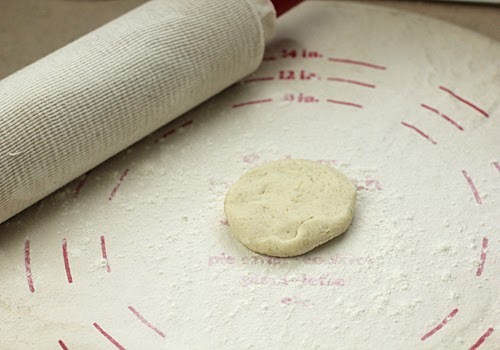 Add more flour to the board and pin as needed. 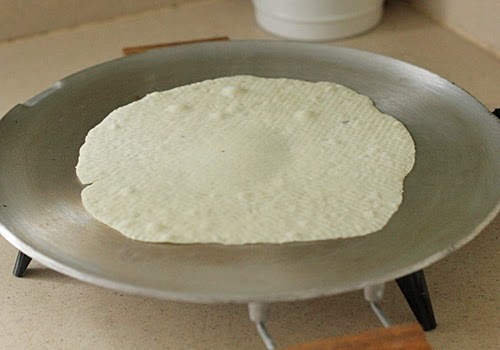 Using the lefse stick again, transfer the lefse from the board to the griddle. 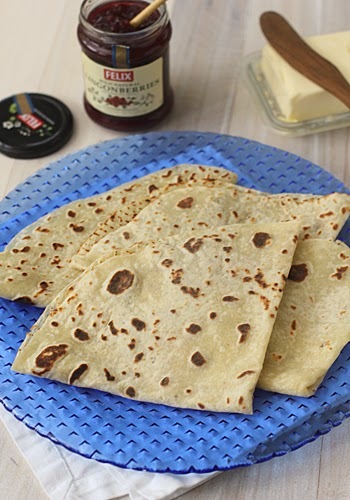 Place the lefse on the griddle. Cook on the first side until it is freckled with light brown spots. 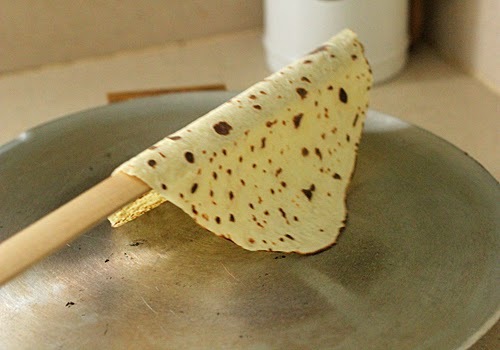 Using the stick, turn the lefse onto the second side. Cook until large brown spots form. 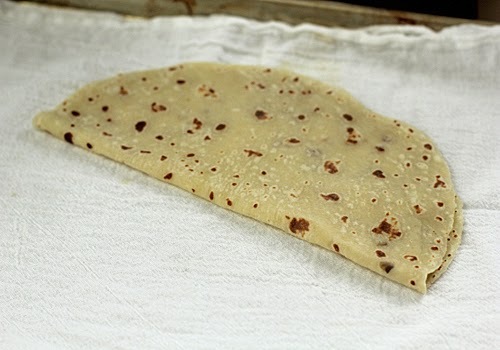 Remove the lefse from the griddle and place large spotty side down on a thin towel. Den yew boil dem til dar done. And by cups it measures vun. An vit two fingers pinch some salt. If it ain't gude it is yer fault. An light brown on stove yew bake. 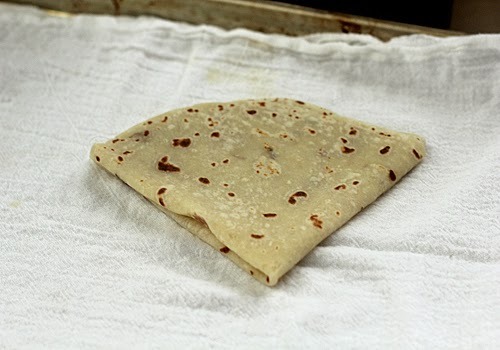 Tew try da fine lefse yew make. Back to the yum list... oatmeal. Not exactly favorite breakfast food around here unless, that is, you ask my husband. Me: "Honey, what would you like for breakfast this weekend?" Husband: "Oatmeal." Kids (and me): "Ugh." Once again, they do like it, just not as much as my husband. But when you are fed foods like Italian Beef, French Fries, and Fried Chicken over the course of two weeks, it is probably a good idea to get some wholesome oats into your diet. 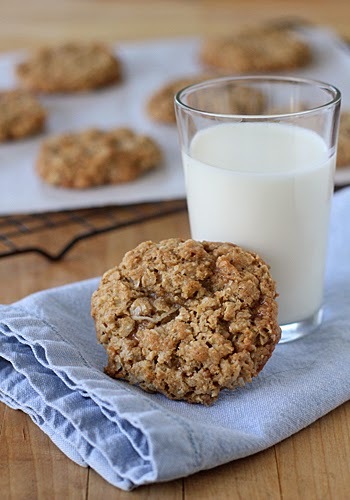 Thinking of my husband's need to take a broom to the ole system and my children's pity, I thought I would make everyone happy with a batch of oatmeal cookies. Instead of "all right, Mom" I got an "alright, Mom!" I like my oatmeal cookies on the thick and chewy side. I also like them with coconut and toffee bits. The coconut adds to the chewiness, the toffee lends a little crunch, and they both provide more sweetness. Don't care for coconut? Omit it. 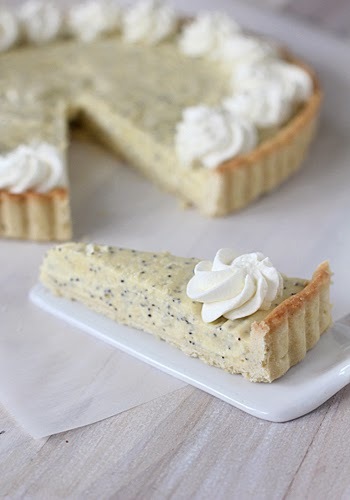 Trying to cut back on sugar or can't find toffee bits? Omit that too. 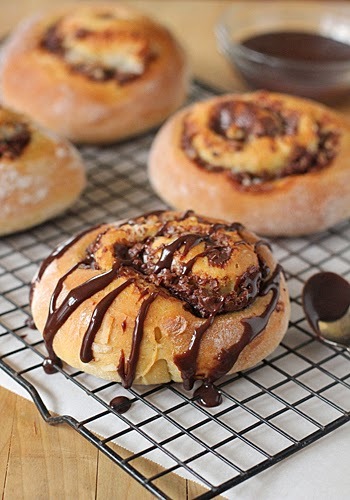 Want to add chocolate chips? Go for it! Just do not ask me about raisins. If there is one food that will most likely never make an appearance in a recipe on my blog, it is raisins. If I was forced at gunpoint or paid big bucks (talkin' millions here) to eat them in cold cereal, I could do it (maybe). But cooked ones? Not-a-chance. It's not my fault though. It is a genetically inherited dislike from my grandfather and mother that my children have now inherited. Any other dried fruit gets a thumbs up from me (including prunes-- I know right?). But raisins... don't even mention the golden ones. I have noticed that there has been some common subject matter on various social media in the past week or so. One is either commenting about the weather (yes, we are back in the single digits-- #whydoilivehere #imdonewithwinter) or sharing that someone in the family is down and out with fever and flu. Well, I can't do much about the weather other than shovel snow, salt the walkways, and complain about how dang cold it is (! ), but I can try to prevent that flu bug from crossing my thresholds. Years ago my children opted out of getting the flu shot (I can't say that I blame them), but only in agreement that they 1. wash well, 2. sleep well, and 3. eat well. That means eating foods that aren't high on their yum list. Red bell peppers are an excellent source of vitamin C, high in antioxidants, loaded with lots of other good stuff, and... definitely not on the yum list for the kiddos. Don't get me wrong, they do like them. But if you were to ask them "what is your favorite thing that mom makes", I guarantee it won't have red peppers in it. After a trip down South last weekend, the only thing my son has had on his mind (or should I say stomach) is a batch of my fried chicken. That's an inherited craving that runs deep in his veins and I will most certainly oblige to that request for tonight's Sunday dinner. And when you have Southern fried chicken on the menu, an old-fashioned Southern dessert is the only way to end the meal. 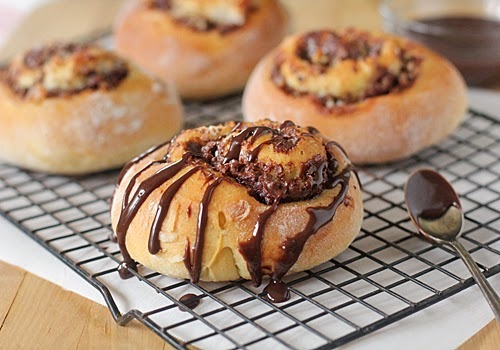 Well that and I had a craving for something with coconut after making the sweet rolls this past week. Sweet rolls, fried chicken, and coconut cake?? Cue the comfy pants and put salads on the menu for the week, Nicole. 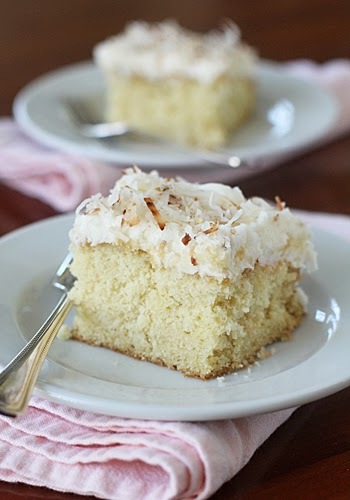 This is a classic sheet cake that triples down on the coconut flavor with shredded coconut, coconut extract and coconut milk. The egg whites are separated from the yolks and beaten until stiff peaks form before being folded into the batter. This makes for a very light crumb to the cake while keeping it sturdy enough to hold up to the frosting. As far as that frosting goes, keep any spoons (or fingers) hidden from sight. I think you know what I mean--there won't be any frosting left for the cake! Mother Nature really gave it to us this past week here north of Chicago (or should I say Chiberia). First it was 48 hours of a non-stop snow storm that left us with almost 2 feet of snow. Then came the wind, a slight thaw, ice, more snow and wind, and then... a huge plunge in temperature. Let's just say that a -50ºF wind chill is pretty darn cold and the holiday break was extended for my children for a few more days. Backing up a few days to Sunday when we were busy shoveling and salting, I needed a Sunday dinner that basically cooked itself. In comes this little beauty of a recipe. Throw all the ingredients in a large pot, shove it in the oven, and let it cook low and slow for several hours until tender and falling off the bone. The original recipe called for cutting slits into the meat and stuffing them with slivers of garlic and thyme, but I find that really isn't necessary when the meat is braising for that amount of time. The recipe also called for just two onions (?). 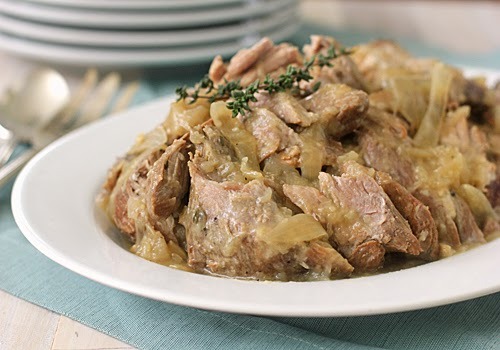 Since we love our onions, I triple the amount so that each and every bite of pork is accompanied with a braised sliced of onion or two. The braising liquid is thickened with a cooked butter and flour mixture (called a roux). It becomes a velvety sauce to dress and serve with the meat and onions. It is wonderful the day is is made, but it can be made up to two days in advance. Any leftovers are excellent when cooked in a cast-iron skillet to achieve a crunchy carnita-like texture.